Social media was one of the most influential digital channels during the U.S. Presidential election 2016 and has been even more present during the U.S. Midterm elections in 2018. Social media provided government parties and their candidates with public platforms to share their opinions online, directly connect with supporters and have audiences discuss political issues – however, for the first time in U.S. elections, social media also played a major role in targeting specific groups of voters with tailored advertising and fake news in order to disrupt public support for leading political candidates; confusing and destabilizing their groups of supporters and drowning legitimate discussions by automated bot postings . For the majority of U.S. adults in 2018, television was the main source for news about the presidential election campaign. However, online was ranked second, ahead of radio and newspaper, highlighting the increasing reach and influence of digital media. Digital news source preference varied by party affiliation, with Google News and The Huffington Post being more popular with Clinton voters and Trump supporters favoring Breitbart and Drudge Report. Politics are not a favorite or frequent topic among general social media users in the United States but social platforms definitely enabled like-minded people to find discussion partners or adversaries during the recent election. According to an August 2016 survey of Facebook users, most people had a mix of political beliefs among their Facebook friends, and only 23 percent stated that most of their friends had similar political beliefs like them. 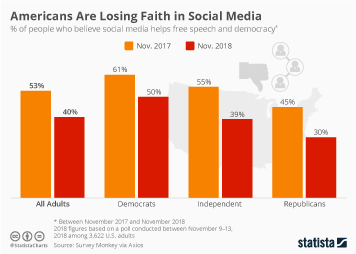 The majority of social media users in the United States have not modified their views about a political or social issue because of something they saw on social media but 20 percent stated doing so. The same was also true about social media users’ views on political candidates – the majority of survey respondents did not modify their views about a political candidate because of something they saw on social media. Apart from Facebook, Twitter also generated a lot of buzz during the election, not only because of then-candidate Donald Trump’s prolific tweeting. Republican nominee and eventual president Donald Trump accounted for the majority of Twitter buzz surrounding the 2016 U.S. presidential debates. This has continued throughout Trump's presidency and not without controversy - during an August 2018 survey, 61 percent of U.S. adults stated that Trump's use of Twitter as President of the United States was inappropriate. Twitter is by far the most popular social platform among members of the U.S. Congress, as 100 percent of Senators and 99 percent of members of the House of Representatives post via official social media accounts on the platform. In 2018, the most active member of the U.S. Senate on Twitter was Marco Rubio (R-FL). Fake news was also one of the most hotly-debated issues during the 2016 election and its aftermath. Websites and political actors which deliberately published hoaxes and pushed misleading information to social networks popped up at an alarming rate and set a tone of distrust for the media during the campaign. Ahead of the 2018 midterms, a majority of voters across the political spectrum were concerned about the influence of fake news on voters and elections in the United States.